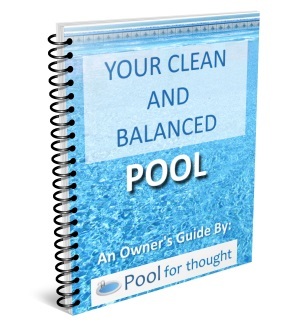 Is your pool water pH high and you need to lower it? Managing pH is a never-ending issue among pool owners. 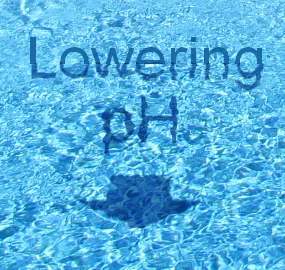 In this article, I will give you all the information you need to lower pH if it is high, and explain why lowering swimming pool pH is important for the overall health of your pool and your swimmers. If you first want a little background on pH and why it is so important, I have created a couple related articles about how to maintain swimming pool pH, and how to test swimming pool pH. pH is used to measure the acidity of your swimming pool, and you need to maintain this pH level consistently within a pH range of 7.4-7.6. This ideal range is considered balanced for pool water, even though this range is technically on the basic side of the scale. Less than 7.4 is acidic, more than 7.6 is more basic. If you have tested your swimming pool water pH and have found you are higher than 7.6, then you need to bring the pH back into the ideal range. The higher you are over, the faster you need to react. Some broaden the range to 7.2-7.8 to give a little more room for pool owners. Within this wider range you are probably OK for a while, but I like to keep mine within 7.4-7.6, and as close to 7.5 as possible. I explain this more in the article: Maintaining Swimming Pool pH. Why lower the pool water pH? 1 Why lower the pool water pH? 2 Why is my pool water pH high? Consistently high water pH can start a domino-effect of pool problems. Here are typical problems pools with high pH can experience. Swimmers might complain about the water, as high-pH water irritates eyes and cause skin to feel itchy and sticky. High pH can cause a hazy, murky, or cloudy pool, making the pool not very inviting. For chlorinated pools, the chlorine added is much less effective at higher pH levels than pH-balanced pools. The extra cost of adding more chlorine is much more expensive then purchasing good test strips or a test kit to do efficient and accurate testing. With this chlorine demand so high, you will also have problems keeping the water balanced as you risk the pool chlorine level going to zero. Contamination can result, causing combined chlorine to show up when you add more chlorine in the pool. Over time, high pH can cause water to scale, resulting in filters and fittings plugging, and pipes gaining scale on the inside. Water scale can reduce water circulation, increasing water pressure in the pool circulation system and placing a larger strain on your pool equipment. This higher water pressure can strain and shorten the life of your pump motor, heater, chlorinator, and filters, plus cause leaks as the increased water pressure pushes water against rubber gaskets and grommets. I discuss in more detail problems you can encounter with improperly balanced pool water pH, in my article: Maintaining Swimming Pool pH. Why is my pool water pH high? Your local water source may have a higher pH, as they tend to avoid water that is too acidic. Municipal water lines and hardware would corrode faster if they put anything less than something slightly on the alkaline side in your pool. So, adding more water to the pool can potentially raise the pH. You may have added to much pH Increaser in the last dose. Be sure to add only what you need to avoid bouncing the pH up and down. It is difficult to provide all the detailed ways to add all the chemicals to add to your pool, as some manufacturers give conflicting instructions. Read the instructions on the container first. If you are confused, either call or stop into a pool retail outlet or ask questions of a local pool service professional near you. They deal with these chemicals and questions every day, so they should be able to answer your questions. First test your swimming pool pH level. Once you know your current pH, then you can determine what you need to lower that value. 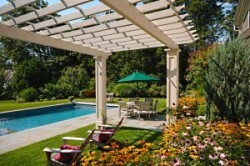 There are two main chemicals to decrease pH in pools. Sodium bisulfate (also called dry acid) and muriatic acid. Both come in many containers, sizes, and names like “pH Minus”, “pH Reducer”, and “pH Decreaser”. Just make sure you know which chemical you are buying because how you add the chemical matters. We recommend staying with one or the other. Sodium bisulfate, also called dry acid, and is used to reduce pH in swimming pools. Read the instructions on the label, as different manufacturers might contain different percentages of Sodium Bisulfate. 93.2% is the most common percentage. Determine how much you need to add, based on your test results. I recommend adding only 3/4 of what is recommended and retest later until you are comfortable with the effect of adding chemicals to your pool. The reason is you want to avoid adding too much. Since dry acid usually comes in a powder, try to avoid adding it on a windy day. If every day is breezy, then apply the powder downwind from you, as you want to avoid getting the dry acid on your clothes and skin. Get down as close to the water as you can, as the wind will easily blow the powder into the air instead of your pool. Try to add the powder into your pool at the water return jet sight(s). This is where the water comes into the pool. Avoid adding the powder at the water inlet sights, such as the skimmer area. You want to spread the dry acid around in the pool as much as possible. The dry acid will dissolve on its own after a 5-10 minutes, so there should be little to no need to spread the powder around in the water by hand. Wait at least six hours for the chemical to mix before retesting, but try to wait no longer than 24 hour to test after adding the last dose of dry acid. For above ground pools, dump the dry acid over the pool wall. As above ground pools are often more shallow then a typical diving pool, you may have to spread the powder in the pool to encourage the powder to dissolve. This holds true for below ground sport pools. If the manufacture recommends you first dilute the dry acid, then definitely follow their advice. The reason is their product may react so fast in your water, that alkalinity will be reduced with no affect on your pH. So, instead of one level out of balance, you now have two. Dry acid will lower your pH as well as your alkalinity. So, remember that you need to test both again. Muriatic acid, used to reduce the pH in swimming pools. Don’t spill it on concrete! Read the instructions first. This is a powerful acid that will burn your skin and damage pool surfaces if not used correctly. Determine how much you need to add from the pH level you tested. You did test, right? If you are still learning, add only 3/4 of what is recommend and test the pH again later until you get more comfortable with the effects of adding chemicals to your pool. The instructions may say to dilute the muriatic acid. Follow their guidelines and dilute with water if required. Even though muriatic acid is a liquid, you still need to avoid dumping this in the pool facing the wind. Do not add the acid into any inlet such as the skimmer or filter basket. “Funnel it to the bottom”. To minimize a decrease in alkalinity, it has been suggested you turn the pool pump off and let the pool water become still for about an hour. You then pour the muriatic acid in the pool carefully, so that you don’t splash it in, but pour a continuous stream into one spot on the water. This stream will flow to the bottom of the pool and gently lower the pH, while not affecting the bulk of the water above. You then turn the pump back on an hour after adding the muriatic acid. The suggested reason is muriatic acid will affect the pool water alkalinity much greater at the surface, so the idea is to get the acid to the bottom of the pool, where it will not affect the alkalinity as much. I would like to hear other’s thoughts on this! “Spread it around”. The typical way to add muriatic acid is to position yourself near the water return jet(s). This is where the water is injected into the pool, from the pool equipment. Get down close to the water, you want to avoid getting the acid on any of the pool decking or coping, or metal surfaces. Dump the acid in the deep end of the pool. If you have no deep end, such as a sport pool, then pour slowly in an arcing line in one area, then move to another area (keeping upwind and away from water inlets or return lines) and pour the rest. You want to avoid too high of acid concentration in any area of your pool. The acid will quickly disperse as it is already mixed with water. Wait at least six hours for the pool to adjust to this newly added chemical. Retest after this, but try to do this before a full day (24 hours). Muriatic acid is caustic. If you get it on your skin it will burn. Wear goggles, gloves, long sleeve shirt, and heavy jeans. Have a bucket of water and a hose with a sprayer attached with the water already turned on, ready to hose yourself or anything else off if you spill. If you do manage to dump it on yourself, wash it off immediately. Do not spill muriatic acid on any concrete, tile, or any other masonry. I cannot stress this enough. If any of you have sealed your garage floor with epoxy based floor covering, a recommended step prior to applying the epoxy is to apply undiluted muriatic acid to the garage floor. This etches the concrete so the epoxy will stick, giving off bluish green fumes that rise off the concrete, plus some bubbling and fizzing that also occurs. When working with muriatic acid over concrete, you can try to pre-wet the concrete with water to help with diluting any potential spills or drops that might end up on the concrete. You typically want to dilute the muriatic acid in a bucket of water to prevent burning yourself, pool surfaces, or equipment. Some muriatic acid containers come pre-diluted so you don’t have to mix with water and you can just apply directly to the pool. Although it may seem crazy to put such a damaging liquid into your swimming pool water, even strong acids like this one are beneficial in small doses. Never pour any chemicals into your skimmer filter basket (if you have one). The water here goes directly to your expensive pool pump, filter, heater, and other equipment. If pH is really low, test strips and even test kits cannot test higher than a pH of 8.6. If this is the case, you will need to add a significant amount of pH reducer or muriatic acid to bring that pH value back down to testable levels. Once you can test pH, then you can fine tune how much more you need to reduce the pH. Use our online calculators to determine how much you need. In general, you add about 2 pounds of dry acid per 10,000 gallons of pool water, but use our online calculators to get a more exact guideline. Again, if your product instructions tell otherwise, follow their instructions. As a pool owner, you will likely become very familiar with your pool pH. 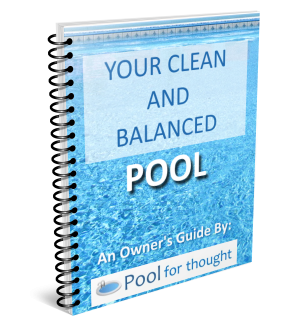 Balancing your pool is just one of the things that must be done, and lowering your swimming pool water pH is an important skill to learn. You need to test pH regularly and correct high pH as soon as possible, to avoid water scaling and cloudy water.